It’s that time of year again: Holiday party season is upon us! To get soiree-ready, a party-goer’s objective is always a dewey, hydrated complexion and worry-free flawlessness. A brightening and clarifying treatment will smooth the texture of the skin, plump, and hydrate, making for perfect makeup prep! The Illuminize Peel This smoothing and exfoliating peel is sometimes referred to in our office as “the red carpet peel”, as it’s a great no-downtime option for those with upcoming special occasions. Utilizing gentle blends of acids combined with anti-irritants, this hydrating and brightening peel can Increase skin radiance and glow, and improve clarity, color, and texture. Perfect for an immediate enhancement of your skin’s appearance! A Chicago Beauty Blogger tries a Hydrafacial at our office – and loves it! Hydrafacial An event-prep favorite of celebs like Whitney Port, Gabrielle Union and Kate Winslet, HydraFacial is the perfect last minute, no-downtime radiance-booster. HydraFacial procedures are customized for you, but typically involve exfoliation with cell-sloughing serums; a pore-clearing extraction (with a gentle-yet-effective suction) and an infusion of skin-hydrating hyaluronic acid and antioxidants. Botox If you’d love to scratch “younger looking skin” off your Christmas Wish List, or just look flawless at your upcoming Christmas party, try a quick Botox treatment. A few (almost painless) tiny injections into wrinkled areas will smooth down deep wrinkles and potentially eliminate fine lines. 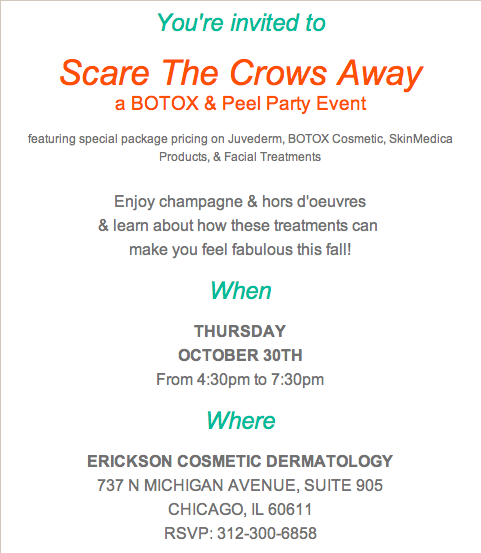 Perfect for party-prep season, Botox does not require any downtime, so you can get in, get out, and get to holiday partying! Just be sure to schedule your appointment at least a week before your special event, Botox will take about that long to ‘kick in’. miraDry Would you love to enjoy a silky or colorful dress without the worry of underarm sweat marks? How about jumping into that killer little black dress without getting white deodorant marks all over it? miradry treatments mean no more white deodorant marks on your dress this party season! 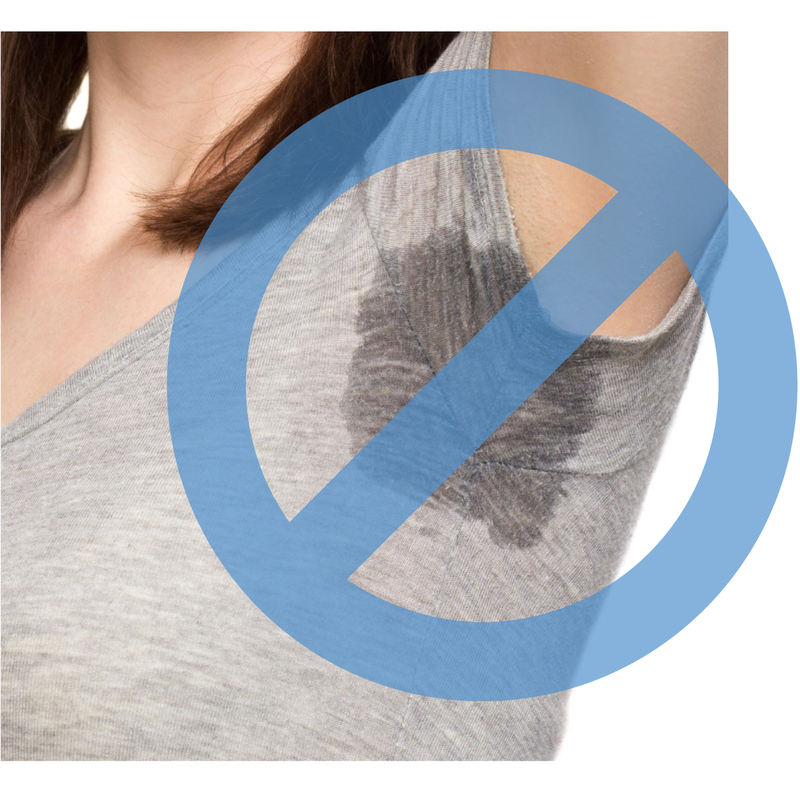 miraDry is an in-office procedure that involves using targeted heat to destroy overactive sweat glands. After the procedure, sweat glands are permanently reduced, making embarrassing wetness a thing of the past. Another great perk? Hair follicles in the underarm are permanently reduced, too. Schedule your miraDry appointment at least a week or two before your event in case you have any mild swelling, but in most cases you can return to work or holiday shopping right after your treatment! 1) Start with a prep mist like GloMinerals Moist Hydration Mist. With ingredients like plumping and hydrating Hylauronic Acid, this moisturizing mist sets the scene for long lasting, natural-looking foundation. 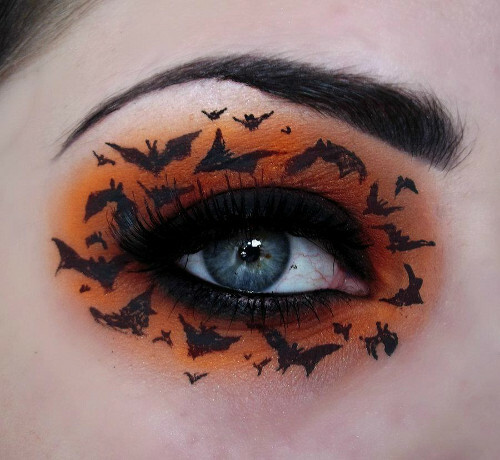 2) Next, apply a satin-like primer to glide makeup over. We love the skin-healthy ingredients and velvety texture of Glo Minerals Face Primer to fill in fine lines and glide over pores. 3) Dust on a mineral powder foundation, followed by a blush and bronzer to contour and highlight. Glo Minerals Pressed Powder foundation features triple-milled minerals and concentrated pigment that makes your complexion look perfect, never ‘powdery’. Optional: mist Glo Minerals Moist Hydration Mist over the top to refresh, further hydrate, and set your holiday makeup. 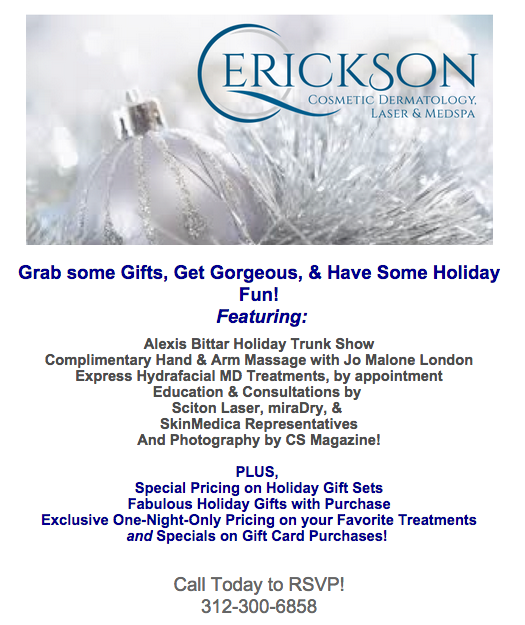 Have a Safe and Merry Holiday Season from Erickson Cosmetic Dermatology, Laser & MedSpa! Receive $100 off your Voluma Treatment! 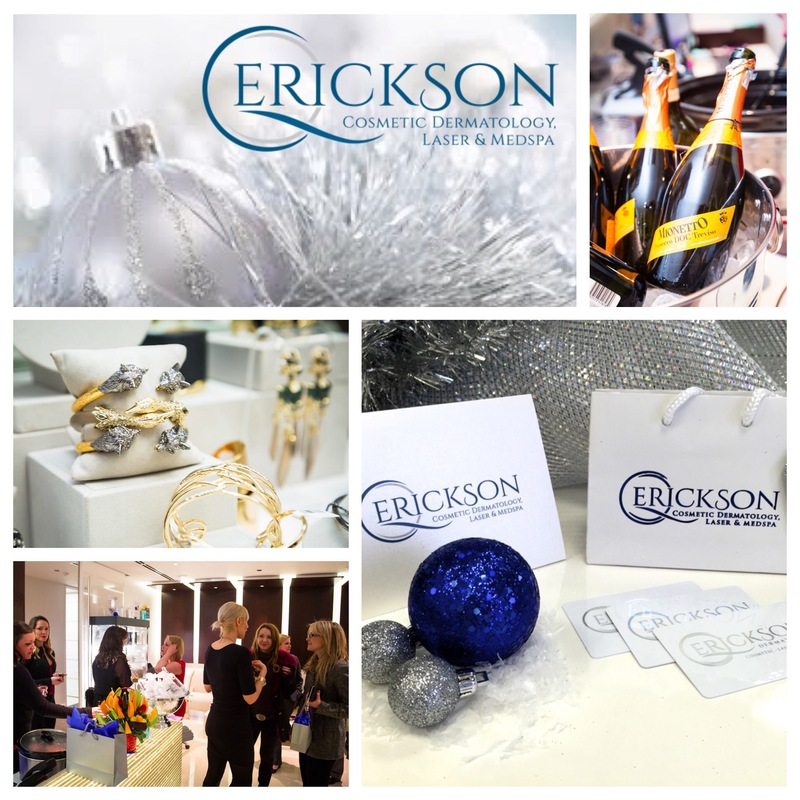 Join us for the Ultimate One Stop shop at Erickson Dermatology Chicago on Dec 11th! 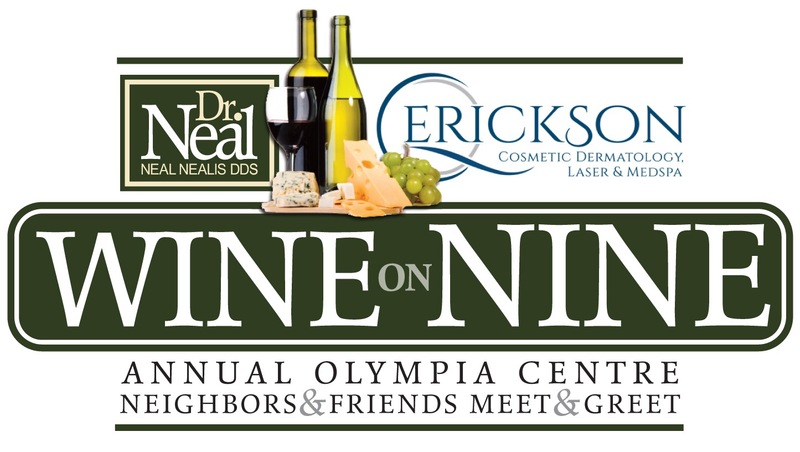 We’ll have one night only exclusive specials on your favorite treatments and products, Holiday trunk shows from Jo Malone London and Alexis Bittar, Express Hydrafacial MD treatments, Jo Malone Hand and Arm massages, champagne, hors d’oeuvres and much more.